"Chicago: We’re happy to welcome over 50 food vendors to the fest this year to help satisfy all of your carnivorous, omnivorous, vegetarian, and vegan needs! Toronto and Denver, your food vendors will be unveiled this week too!" Update (08/27/14): Toronto! You finally got something announced today! Too bad it's just your food vendor list, but hey, it's something. Wait, you finally get your FAQ, too. They have to release your map, & schedule soon, right? "This year’s Riot Fest & Expo in Toronto, ON will feature a wide array of food options sure to cover the bases for any taste palate. Whether you’re craving carnival food, a burger, tacos, or some dessert, these 20+ vendors will have delicious fixings to satisfy your hunger and taste buds!" Update (08/29/14): And nere's your list, Denver. 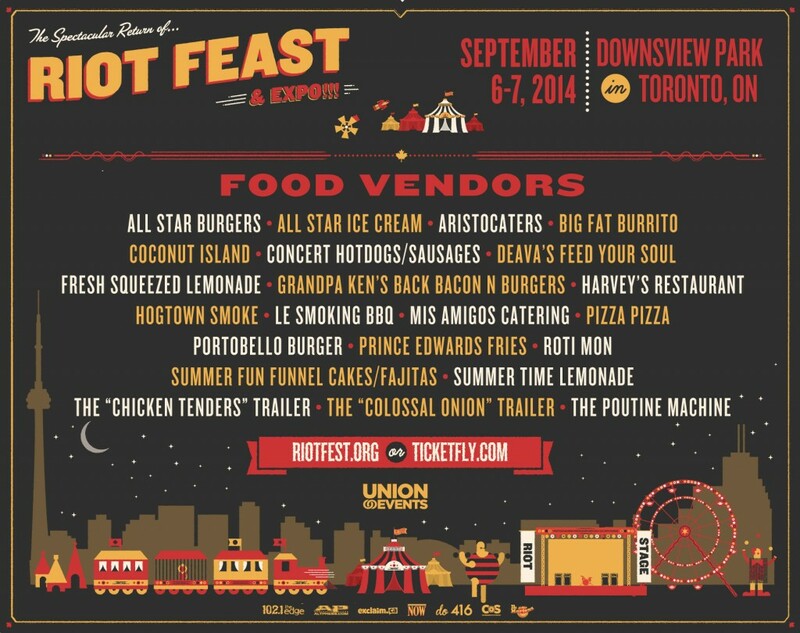 "We are pleased to announce the official RIOT FEAST! 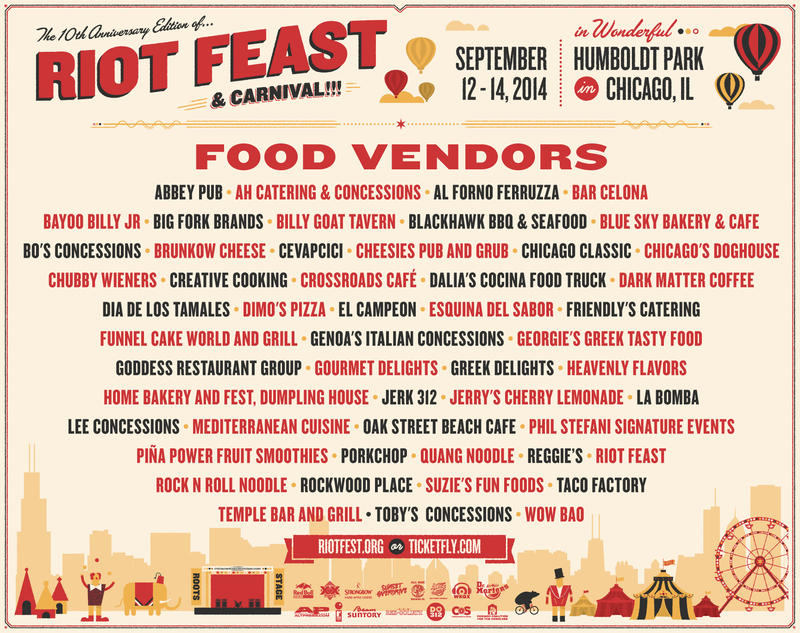 Check out all the goodness these amazing vendors will provide this September. We're hungry..."
Some more items from Porl Thompson are being auctioned. 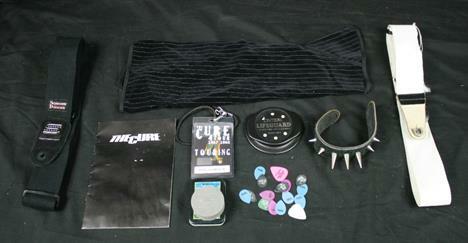 Lot 20 - PORL THOMPSON OF THE CURE - collection of items owned and used by Porl during tours with Jimmy Page, Robert Plant and The Cure to include spiked leather wrist cuff, 2 x guitar straps (1 x black/1 x white), black velvet pin striped sleeve with velcro fastenings, Paul's backstage pass for 'The Cure 4 Tour' 2007/8, Ontek Lifeguard guitar humidifier model 100S and a small tin containing 16 x plectrums (9 are personalised with Porl's name). Also included is a small 12 page booklet with images of the band which has some water damage. "WIN (2) THREE DAY passes to #riotfestdenver courtesy of #MyxedUp and @SodaJerkCO! Just stop in any Myxed Up store & ask to sign up!" Also, Television has been added to the Riot Fest lineup on Sept. 13th, replacing Marky Ramone. Update (08/26/14): Some changes & additions. From Riot Fest on Facebook - "Chicago. We just added some Aftershows, well technically they are pre-parties. The Murder City Devils at Double Door. Also, we know that tickets for the Television Aftershow went very quickly, so to give more people an opportunity to see them, the show has been moved to Sunday, September 14th at Bottom Lounge. Tickets are on sale now, get them while they're still available! http://riotfest.org/chicago-official-shows/"
From Riot Fest on Facebook: "DENVER. JUST ADDED: STRUNG OUT, Frnkiero and the Cellabration, Baby Baby, The Picturebooks, All Out Helter, Wiredogs, Brick + Mortar, Only Crime, Touche Amore, The Epilogues, The Dendrites, and In The Whale. SHARE or COMMENT for a chance to WIN A PAIR OF TICKETS!" MARQUIS THEATER - 2009 LARIMER ST.
A book featuring rare and previously unseen photographs of The Cure is set for release next month. Collated by the band's official photographer Andy Vella, Obscure will be released on September 18 and includes a foreword by frontman Robert Smith. Smith says the book is "dreadfully funny, terribly honest and strangely melancholic." Vella co-created the artwork for many of The Cure's albums, including Faith, The Top, The Head On The Door, Disintegration and Wish, and has worked with the band since 1981. The book features photographs spanning four decades and includes shots from this year's gig at The Royal Albert Hall. "I get something different from Robert because I've known him for so long", Vella tells Classic Rock. "He plays to my lens in a completely different way to others. When I'm photographing other people, for example fashion shoots, it's very much like I'm in charge, but when I photograph The Cure, they are. Quite often, the band don't take me very seriously: Boris Williams [former drummer] used to throw stuff at me, while Roger O'Donnell would always say that my flash hadn't gone off. As a result, I'm able to capture the band enjoying themselves in a way that isn't usually seen. "It really annoys me when I read about the band being such miserable bastards, because they're really not, and I think I capture that. I want Cure fans to see them in the way that I do. You can go on the web and see loads of shots of Robert, but the problem with press shoots is that they always show the band in a certain way. This is different: it's a little bit fly-on-the-wall. "I think fans will end up loving the band more than they do already. When I was putting this all together, I was thinking 'there's so much stuff! ', but it feels like a really powerful collection. It's not pretentious, and it's not po-faced: from page to page, it's more like a documentary. And that's what I wanted." Obscure is available now to pre-order from Foruli Codex. 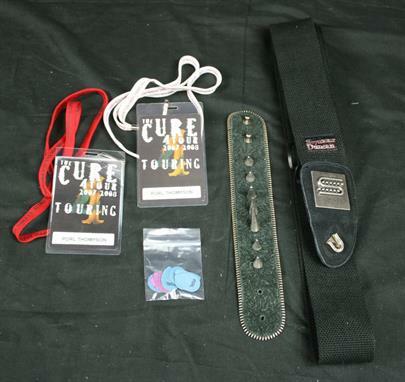 Lost & Found: Where’s the Cure’s Horn Section and Robert Smith’s Crazy Hair?